18th District (Near North) Police Cmdr. Paul Bauer, 53, who was shot to death on Feb. 13 by an armed suspect who had been fleeing from police officers, is being remembered fondly by those who knew him. “He was a policeman’s policeman and had the respect of the entire force. We had a close professional relationship and he cared deeply about serving his district,” said Ald. Michele Smith (43rd) in a written-statement on Feb. 14. Named as the commander of the 18th District in July 2016, Bauer served more than 31 years on the city’s police force. Ironically, at the time of his death he was outside of the 18th district. Bauer had gone downtown for a training-session and was getting ready to attend a meeting with a group of aldermen. Despite his rank as a district commander, Bauer selflessly headed towards danger when a call went out for help. His decision was not out of character. Bauer had long ago earned a reputation as someone who was passionate about serving the public, whether it meant confronting a dangerous armed suspect or meeting with concerned city residents. “Commander Bauer made community-outreach a priority, attending countless meetings and hosting a monthly coffee with the commander meeting in his district. As a testament to his public service, he earned 67 various awards and honorable mentions, including two for crime reduction,” according to a written statement from Anthony Guglielmi, chief communications officer at the Chicago Police Department. In November 2017, while speaking at the annual meeting of the River North Residents’ Association, Bauer had expressed frustration with recent changes in how suspects were being treated by Cook County’s criminal justice system. Loop North News reporter Steve Dahlman recorded Bauer’s comments. “Even when we catch somebody, there’s still a long way to go to get them off the street,” Bauer is recorded as saying in an on-line article posted on Feb. 14 by Loop North News. At that meeting, Bauer complained about what he called was “a high bar to prosecution” and was especially dismayed the criminal justice system had become lenient with habitual offenders of violent crime. Not ironically, the man accused of killing Bauer had received multiple felony convictions. “We’re not talking about the guy that stole a loaf of bread from the store to feed his family We’re talking about career robbers, burglars, drug dealers. These are all crimes against the community. They need to be off the street,” Bauer had said at the November meeting. Among those singled out for criticism by Bauer was Cook County Sheriff Tom Dart. Bauer did not understand why the sheriff would have been proud of a policy that had resulted in a significant decrease in the inmate population at the Cook County Jail. “Maybe I’m jaded. I don’t think that’s anything to be proud of,” Bauer said, according to the article published by the Loop North News. In February, Ald. Smith (43rd) praised the candor of Bauer and added he had been among the first to alert the city council about how changes in enforcement and prosecution had been negatively impacting the city. “Commander Bauer was one of the first to alert us to the alarming trend of repeat juvenile offenders committing crimes in the 18th District and across the city. Ironically, the last conversation I had with him concerned looking at the numbers behind this trend and our plan to discuss what the data would yield. I am heartbroken for his family and our city. He will be sorely missed,” said Smith in a written statement. In her February constituent newsletter, Smith observed that there had been 1200 arrests of juveniles in 2017 for gun-associated offenses. These offenses include unlawful use of a weapon, armed robbery, vehicular high-jacking and other violent offenses (not including murder, which is always treated as an adult offense). “A large number of juveniles were immediately released, even though they were arrested for these violent offenses involving guns Forty-two percent of juveniles arrested for a gun-offense were rearrested in the same year. Of those, half of the arrests were for gun- related or other violent crimes. Of the 717 juveniles arrested for a gun-crime between January 1, 2017 and August 1, 2017, 123 of the re-arrests in the first seven months were for violent crimes and gun-cases. These ranged from battery to unlawful-use-of-a-weapon, aggravated hijacking and murder,” Smith added. A resident of Bridgeport, Commander Bauer leaves behind his wife Erin and his 13-year-old daughter, Grace. To donate to the Chicago Police Memorial Foundation in memory of Commander Bauer visit https://www.cpdmemorial.org. 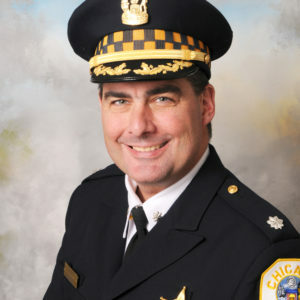 To donate directly to the Bauer Family, a memorial fund has been established for fallen Chicago Police Commander Paul Bauer at the Chicago Patrolmen’s Federal Credit Union. If you would like to donate to this account, please visit any of our locations, or call 312-726-8814. Checks can also be mailed to Chicago Patrolmen’s Federal Credit Union. Please make check payable to: Paul Bauer Memorial Fund.